WASHINGTON – In a move that is expected to help millions of workers, the Labor Department and other federal agencies proposed new rules on May 27 governing federal contractors, mandating they must obey various labor laws – or correct their abuses with DOL guidance and help – if they want to keep bidding for and getting the government’s business. The new rules implement an executive order issued last year by President Barack Obama, but they won’t take effect for at least 60 days – the time allowed for notices, comment and feedback. The rules would apply to all contracts of at least $500,000. The new rules say that to bid on government business, contracting companies must certify they follow a variety of workplace laws, including the National Labor Relations Act, the Occupational Safety and Health Act, the Fair Labor Standards (minimum wage and overtime) Act and the Family and Medical Leave Act. And contractors would have to be responsible for their subcontractors’ compliance. Federal contractors also must give their workers “necessary information each pay period to verify the accuracy of their paycheck” including whether their employer considers them as “independent contractors,” not covered by labor law, the rules say. Companies that get federal contracts employ more than one of every five U.S. workers, studies show. And the rules “also ensure workers who may have been sexually assaulted or had their civil rights violated get their day in court, putting an end to mandatory pre-dispute arbitration agreements covering these claims at large federal contractors,” DOL adds. “Companies that violate labor laws will face consequences,” said Debra Ness, executive director of the National Partnership of Women and Families. “That, in turn, will help prevent millions of workers from being subject to harmful or unlawful treatment,” Ness said. Her group has campaigned for the new rules, because they would especially help underpaid woman workers. 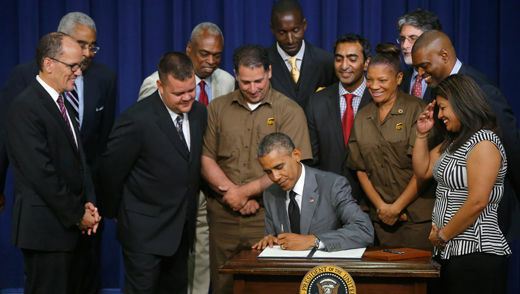 She called DOL’s proposed rules “good news for workers, taxpayers and the nation – and a major step forward in ensuring only companies that abide by our nation’s labor laws get federal contracts. But the rules do not throw bad apples among contractors out of the barrel, by barring violators from bidding for federal pacts – unless federal contracting officers find those bad actors have a pattern of repeated, serious or willful violations of labor laws. Other violators would get a chance, with DOL aid and guidance, to correct their abuses, the rules say. “The opportunity to contract with the federal government is a privilege, not an entitlement,” Obama’s Labor Secretary, Thomas Perez, warned. “Taxpayer dollars should not reward corporations that break the law, and contractors who meet their responsibilities should not have to compete against those who do not.” Labor Department guidance “will provide contracting officers with the necessary information to ensure accurate, efficient, and consistent compliance with labor laws,” he added. DOL’s rules declare that “It is the policy of the federal government to promote economy and efficiency in procurement by awarding contracts to contractors who promote safe, healthy, fair, and effective workplaces through compliance with labor laws. The prospective bidder – offeror-“must represent whether, in the past three years, it was found to have violated labor laws.” If it admits to violations, the contracting officer “will require” details of the violations, including “mitigating circumstances and remedial measures, such as labor compliance agreements.” And the bidder must update the info every six months.